A dry windy day is the perfect laundry drying opportunity, but what if you have a lot of washing and not a lot of space? In that case - you need a rotary washing line! These designs are not new - but often the best ideas stand the test of time. If you have a family and want to dry clothes quickly outdoors, they are an ideal solution. Buying a washing line is not something people put a lot of thought into - but they should! The right design will help you dry more clothes quickly, and make laundry day less of a chore. Why Buy A Rotary Dryer? Is the space you have for drying clothes at a premium? Have a small garden or yard? In that case, a rotary airer is ideal. These lines are really compact and you can dry a lot of clothes on them. The great thing about them is they fold up so you're kids and pets won't keep bumping into them. They're also a lot less hassle than a regular washing line. These often sag in the middle and need a prop to stop clothes trailing in the mud. Drying wet clothes indoors is also a primary cause of damp and mould. An outdoors clothes line can prevent this happening to you and your family. Here are some important things to consider before buying your new line. What separates a cheap rotary dryer from an expensive one? The following list will give you an idea of how they all differ and the features you should look out for. 3 or 4 Arms – in our opinion, the best designs all have four arms, and we reckon that makes quite a difference in terms of stability and efficiency. Length – those we looked at range from 30m to 50m in length; this will determine how much laundry you can dry at once. If you have a large family, the bigger the better, and bear in mind that you some of the designs do come in different sizes. Turning circle – check the space needed for the clothes line to turn freely, and add a bit so that you can get around it easily. Those on are list are all suitable for smaller areas – some are very compact indeed – but make sure it will work in the space you have available. Ease Of Use – this applies not only to the actual use of the device – you want it to be easy to assemble and to lift the arms into position – but also to how easy it is to dismantle for storage and to move around. If you want one that you can use and put away, some of these come with a protective bag with a hanging loop. Adjustable - The best clothes airers can be adjusted to different heights. This makes things more comfortable for you. You can lower the line for heavier items like wet sheets and then hoist it higher again. Additional Hanging Points – some of these feature holes in the arms and hooks at the end to give you added capacity, and this can be a very valuable asset if you have a larger load of washing to deal with. Wind Power - If you buy a heavy-duty airer, it will be able to turn in the breeze. This will help dry your clothes faster and keep them smelling fresh. When considering the best rotary washing lines of 2019, we kept in mind all the key features that we outlined above. We're confident you'll an airer on our list that fits with your budget and space. 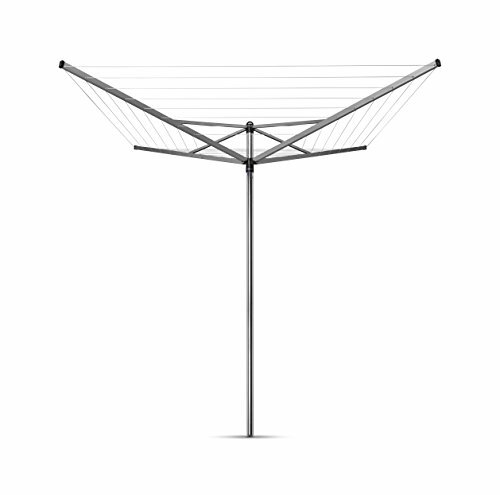 Our first choice is this model from Brabantia, who offer a wide range of rotary airers. This one is a sturdy, four-arm rotary washing line, and is made from long-lasting metal with strong nylon. The lines offer a choice of three different positions; this serves the purpose of changing the tension, so you can adjust the line for a full load or for lighter laundry. You also get a 45mm metal spike that drives into the ground, into which the rotary airer slots neatly, for easy removal if needed. The model featured here is the 40 metre version – that’s how much drying space you get when it is fully extended. There are larger models – 50m and 60m available. 40m should be adequate for a small family. This line's smooth rotation will take full advantage of even the lightest wind. When fully extended it comes to 2.72m across, so you need clearance of a little more than that to enable effective use. Also, it is designed to be easy to lift into position thanks to a clever yet simple mechanism. This is a high-quality clothes airer from a brand that really stands behind it's products. They offer a 5-year guarantee on all their lines, so you'll definitely get your money's worth. Before we go into detail, it’s worth noting that this ​clothes dryerl is designed to be portable. It is somewhat smaller than most – with only 16m of line – and is perhaps more suited for a single person or a couple. It is also useful as a camping washing line, or on a caravan holiday. It's easy to take apart and carry around. Despite its limited capacity, this airer is a clever little rotary dryer with some interesting features. To begin with, while most of the bigger models are designed to be slotted into a buried spike or fitment, this one has a retractable base with four legs. There are pros and cons to this: the advantage is it can be used on a hard surface, so if you just have a yard this is perfect. The downside is that it will not be very steady in anything more than light winds, which sort of defies the object. This design shouldn’t be written off though, as it is well-made and does the job, with a smooth turning action thanks to clever design. It’s made from sturdy aluminium, too, and is light enough to carry around. It’s also very compact, so if you have a small available area, this could be the one you need. If you're in the market for a portable rotary washing line, this is available at a great price. We have included this model from the Brabantia range as it represents their basic and budget model. It’s a three-arm design, which may put some buyers off, but at the price it is very good value and may be just the thing for a family on a budget. There’s no need for fancy bits when it comes to clothes lines, after all, so this one fits the bill. Unlike many cheaper airers, this one comes with a "Plastic concrete" anchor tube which can slot into a base. The Barbantia Essential has 30m of line, but they also have a 40m model if you need more space. Other optional accessories include a line cover and pegs, which come at an additional cost. This design's arms are lifted using an umbrella system which is very easy to use, and it can be stored away when folded as it is very compact. The arms are fitted with holes for hangars – a nice touch that gives you added versatility – and it also comes with a 5-year guarantee for added peace of mind. This is a good, no-frills rotary airer. It's only let down by being a three and not a four-arm model. Still, it's ideal for an average-sized family. With a strong 4-arm design, a generous 40m of line and currently available at a great price, this line was an easy pick to include. ​The frame is made from steel so is sturdy and will last – indeed, the 40mm centre pole is a good size for even the heaviest winds – and has four different tensions for full adjustment. This 4 arm rotarty washing line ​not only comes with a free ground spike but also with a handy cover, which is a nice touch. It’s easy to lift the arms with the usual umbrella action, and when fully extended requires a turning circle of just more than 2.5m, so is great for even the smallest of yards. This one features a nice easy moving mechanism so will react to light winds, and is easy to dismantle if you do want to store it away when not in use. This rotary airer is suitably light, too, so you can move it from place to place with ease. If you are looking for a no-nonsense and simple to use, rotary washing line with cover, this one represents great value for money. Our final rotary airer is from Parkland, and we rather like it! First, this one uses a rectangular arm design. This claims to have benefits over the usual tubular models in terms of strength. Second, it offers 50m of line, which is the most of any model we have included on this list. The line is 3mm diameter, too, so it is strong, and it has a 40mm pole so will withstand stronger winds. It is not equipped with alternating tension, however, although it does move freely – users have reported it being effective and withstanding heavy winds. It also has a two-piece centre pole, so you can dismantle it easily. When fully extended, it needs a little over 2.5m to turn, so is fine for smaller spaces, too. This Parkland design is one of the cheapest on our list, but you're still getting 4-arms and 50m of line, so it's easily the best one for the money. Which Rotary Line Is The Best? A rotary washing line is a practical item, so you need to buy the one that will handle the laundry you usually wash. If you are a single person with very limited space, it – the Multiware, number two on the list – may well be fine for you, as it would if you are looking for a camping washing line. However, for anything more than two people, a 40m line is perhaps essential. This will give you the capacity to handle an average wash.
Each of these bar the Multiware is fine in that respect – and there are larger models of some available – but we believe the first in the list, from Brabantia, to be the best of the bunch. The Barbantia Topspinner is sturdy, well-made, and it's 5 year manufacturer's warranty puts it head and shoulders above the competition. We hope our reviews have helped you find the best rotary washing line for you and your clothes. Here’s hoping the weather is always right when it comes to laundry day! For drying clothes quickly indoors, be sure to check out our page on the best heated indoor airers!